March is National Nutrition Month and coincidentally, perhaps, everyone’s talking “ultra-processed” foods. The latest USDA dietary guidelines confirmed what many of us already knew – that a diet filled with processed foods in too high is added sugars, salt and fat. Consequently, we are advised to consume healthier, fresh, unrefined and unprocessed foods like vegetables, fresh greens and fruits, and greatly reduce our consumption of processed foods. Now comes the new buzzword – ultra-processed – and yes, there is a difference between minimally processed foods and ultra-processed food-like substances. 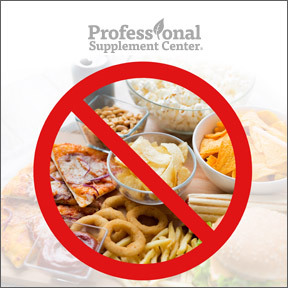 Essentially, any foods that come frozen, canned or prepackaged are considered processed foods. Anything that is not eaten fresh from the ground or picked off a tree is at least minimally processed. Many of these are healthy foods like frozen vegetables, dried beans, pickles or unsweetened nut butters. However, health promoting ultra-processed food does not exist in nature. In fact, ultra-processed foods contain ingredients not recognized as food. And, according to a new study published in the BMJ Open, the added sugars found in ultra-processed foods are the driving force behind the obesity, heart disease and diabetes epidemics in the U.S.
What exactly is ultra-processed food? According to researchers from Tufts University and the University of Sao Paulo, “Ultra-processed foods are defined as industrial formulations which, besides salt, sugar, oils and fats, include substances not used in culinary preparations, in particular, flavors, colors, sweeteners, emulsifiers and other additives used to imitate sensorial qualities of minimally processed foods and their culinary preparations.” In other words, it’s designed to look, smell and taste like food and “disguise the undesirable qualities of the finished product.” In simple terms, ultra-processed foods contain ingredients that would not be found in home kitchens or used in home cooking. Sound yummy? While we may enjoy the taste and texture of frozen pizza, soft drinks, sugary cereals, chips and packaged snacks, these products contain ingredients our bodies simply do not recognize as food. Even worse, these foods are deleterious to our long-term health, leaving us both overfed and undernourished. Researchers found that almost 60% of calories Americans consume daily come from ultra-processed foods. They also found that added sugars represent at least one of every five calories consumed, or about 90% of our added sugar intake. So, when we regularly consume ultra-processed foods not only do we overeat, we greatly risk exceeding the recommended upper limit of no more 10% added sugars daily. Researchers found that the content of added sugars in ultra-processed foods averaged 21%, while the average amount of added sugar in minimally processed foods was about 2 ½ %. The study demonstrates that a reduction of ultra-processed products not only results in lowering added sugar consumption, but also reduces consumption of unhealthy fats and excess sodium. This, in turn, leads to a higher overall consumption of whole foods and a higher intake of fiber and nutrients, which helps to lower the risk of obesity, diabetes, and other age-related chronic diseases. Ultra-processed food products are strategically designed to induce cravings, so that you will continue to buy and eat more of these products. One of the best ways to improve your nutrition and break away from sugar and chemically laden addictive foods is to make more meals at home using ingredients you can pronounce. As proper nutrition equates to good health and poor nutrition equates to disease, it appears to be past time for many Americans to hop off the bandwagon and consider choosing nutrition and long term health over short term convenience. This entry was posted in Home and tagged Ultra-Processed. Bookmark the permalink.